← Time to bid farewell to professions? In Legion we earned honor to get honor levels; once we reached honor level 50 we’d gain a prestige rank. We got a reward at every prestige – ranging from pets, artifact appearances, mounts and pennants to titles. However every character was separate – work done on one character was not reflected on another. Their progress was separate. That last one is somewhat annoying; rather than make up new rewards, the existing rewards from prestige levels have been pushed out. Using the prestige shown on my Legion PvP guide on WoWHead as a comparison against the Battle for Azeroth honor level rewards.The table below shows the honor level required to obtain a reward and these are often associated with achievements; eg honor level 10 has an achievement called that. I’ve also included the old prestige level required for an item if it was available in Legion. Most of the rewards come from the existing prestige system. They’ve added a new toy, pet and mount for BfA. At high honor levels. Its noticable the current artifact looks you can obtain at prestiges 2, 6, 11 and 15 aren’t currently shown on any of the achievements. Such is the joy of the beta – its always changing! But, you may be thinking, We’ve currently got levels of prestige. How do they relate to the BfA honor levels? Well, this is where it gets painful. At least with the current values the beta has. I copied a number of characters across to the beta to take a look. My main who is capped on honor at prestige 25, honor level 50 ended up giving me an accountwide honor level of 146. That’s 104 honor levels short of a mount I already have! I’m very glad the WoW Devs have said they’ll be letting us keep rewards we’ve already earned – it would be really painful to have hard earned mounts taken away from us! Their combined honor gave me an honor level of 186. This does make some sense, from a game perspective. As you don’t want people to come out of Legion and immediately get the rewards from the next expansion. But it also means that the higher rewards are going to take an insane level of work to achieve. Especially the rewards beyond 300 as the rewards are only every 100 honor levels. From calculations for numbers below, it feels like each honor level takes 10k Honor to gain; actual number works out to ~9,800 honor, but that seems like a strange number! We can’t be sure of the number right now as the honor level UI on the beta doesn’t have a handy figure shown on mouseover. Adding up the prestige levels gives me an estimate of how much honor is required to get that honor level of 186. That’s a lot of honor. Assuming it scales linearly, we’re going to need ~4,500,000 honor to reach the 500th honor level. And I’m sure that someone out there will have 4 chars at the prestige cap, with another at prestige 1, who’ll obtain that though! However most players aren’t going to have done that. Thanks to us keeping rewards which will be given for high honor levels, you can get a lot of those rewards now if you grind out the honor required before Battle for Azeroth hits and pushes the rewards further out. This entry was posted in Beta, Legion, PvP. Bookmark the permalink. Thank you for the breakdown. Grinding Prestige is the the longest grind I imagine. I have not started, or intend to, I think. Gosh. I guess this is the PvP version of AP. Kind of; it’s more for the rewards! 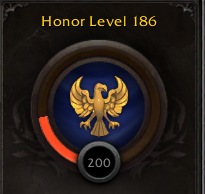 If you don’t do Arenas or Rated BGs the only rewards you’ll get from PvP will be from the honor you earn going towards prestige now & honor levels in BfA. It can feel a bit grindy, but I also enjoy PvP and chasing honor for prestige had me going into BGs a lot more in Legion than I have done previously.